We are becoming more and more dependent on digital data with the development in technology. The amount of data that we currently have has never been this high. It’s not just the capacity that we look for, but speed also matters. No one likes slow and sluggish data processing. 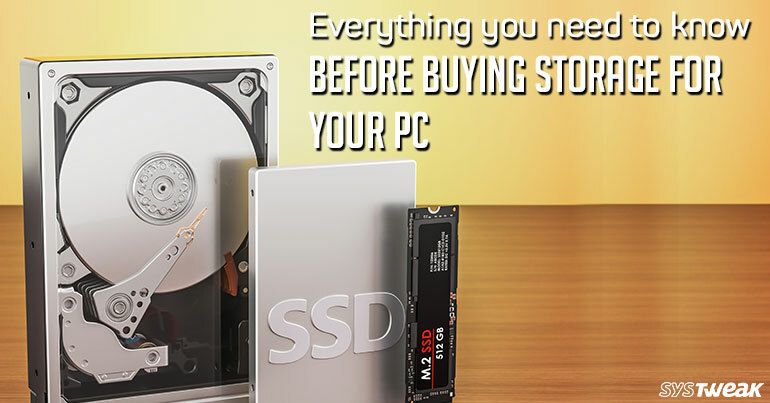 But the question is how to identify best storage device for our PC that makes processing faster? The common mistake that we make is to only focus on storage space rather than on both space and speed. To make things easy we bring for you a simple guide to help you identify the correct storage device for your machine. Whether you want to buy a new one or just want to upgrade, this article will help. No specific skill is required to select a hard drive, just the know-how of the size and speed of the drive will help. Must Read: Is Cloud Storage A Credible Solution? Peripheral Component Interconnect Express (PCIe). SATA is been used for years and is the most common of the drivers. But only few know it is advanced version of Parallel Advanced Technology (PATA). It has improved speed, consistency, has a thinner interface and cables aid in less power consumption. The first one is commonly known as Hard Disk Drive and has been around for a much longer time. But slowly they are being replaced by flash based drive know as Solid State Drive. The reason is simple, Solid State Drive are faster and more reliable. But they have certain limit on read and write operations. Also, the way disk based drive work is different they have a physical disc inside connected to a plate with a read and write head performing the job of reading and writing the data. They spin at a rate of 7,200 rpm, contain moving parts and thus are prone to damage making repairing them difficult. Not only this they need more power and produce heat. As opposed to them Solid-State Driver (SSD) use integrated circuits and don’t have any moving parts thus produces less heat. They are smaller, use less power and shock proof meaning they are almost maintenance free. The latest and the most advanced hard disks are PCIe based SSDs, they offer enhanced performance. Also, as compared to SATA based SSDs they have a limited capacity of the bus that transfers data from the SSDs to the processor. So, does this mean we should buy the latest and advanced one? No, not at all you should select the disk as per your requirement. If you want more storage and speed is no issue can go with Disk Drive as they are light on pocket and give more storage space. But, if speed matters then SSD is the right choice, as SSDs load programs faster and increase the total performance of your PC. However, if you want to upgrade your HDD then move to SSD as it will boost the performance, make the system run faster and will also reduce power consumption. But there is an issue with SSD, a large capacity SSD will be heavy on your pocket. If it doesn’t matter then go with 250GB or a 500GB SSD. However, if you have two drive slots then nothing can be better. Use the primary slot for SSD, install the operating systems and resource intensive programs on it and use HDD to save other programs. This smart step will boost overall system speed and you will save that there is less power consumption. While going for SSD you may see another form of storage as M.2 drive. It is a type of SSD but with an advantage over SSD. It is connected via M.2 connector to an M.2 slot on the motherboard and offers 600MB/s speeds, provides backward compatibility for systems with SATA support. Also, it is much superior and is designed for high-speed flash storage. M.2 drives need a special slot on your motherboard, which is expensive. Hope with the help of this small guide you will now be able to select the right drive for your PC. Surely SSD is a win- win choice but a larger SSD will cost more so as an alternate if you have 2 slots can use both SSD and HDD. Also as SSD has limit on read and write operation we need to careful while making it for heavy operations.